They are humans' closest relative, sharing a similar genetic make-up and displaying behaviour not unlike our own. 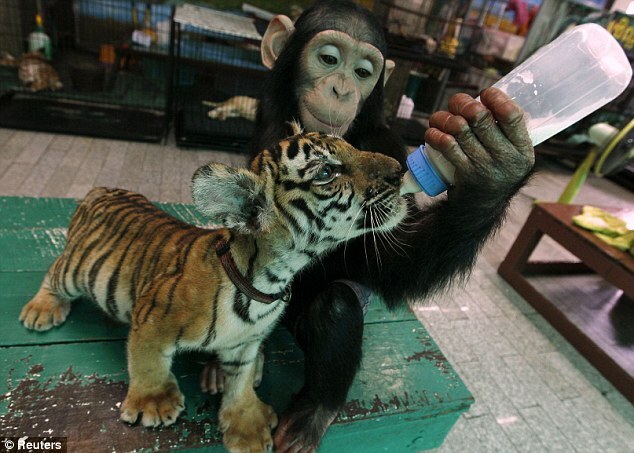 Now this little chimpanzee is showing off a motherly instinct to rival even the most maternal of mankind. 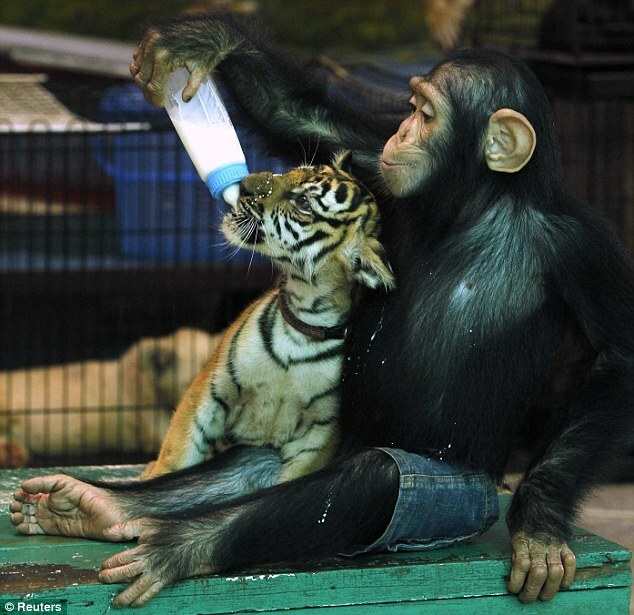 These adorable images reveal the close bond that has formed between a two-year-old chimpanzee called Do Do and a two-month-old tiger cub called Aorn. 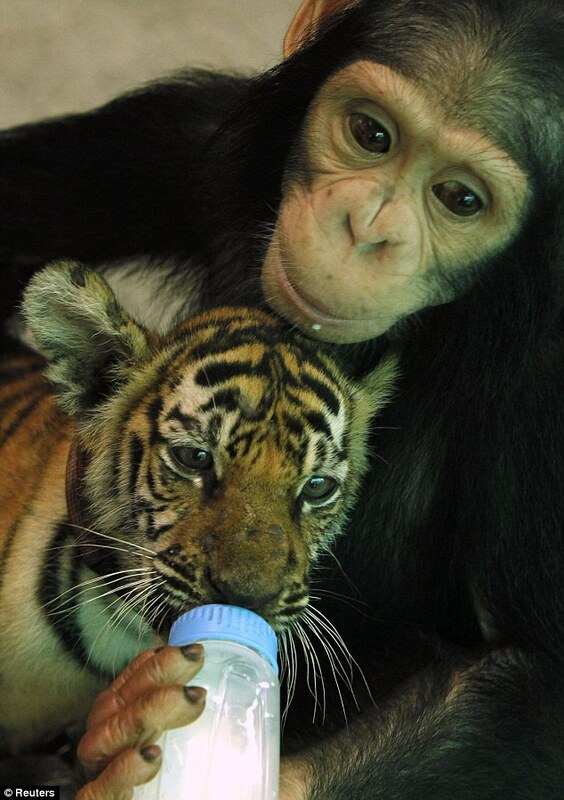 Completely at ease in each other's company, the ape's motherly instincts take over as she attentively bottle feeds the baby tiger. 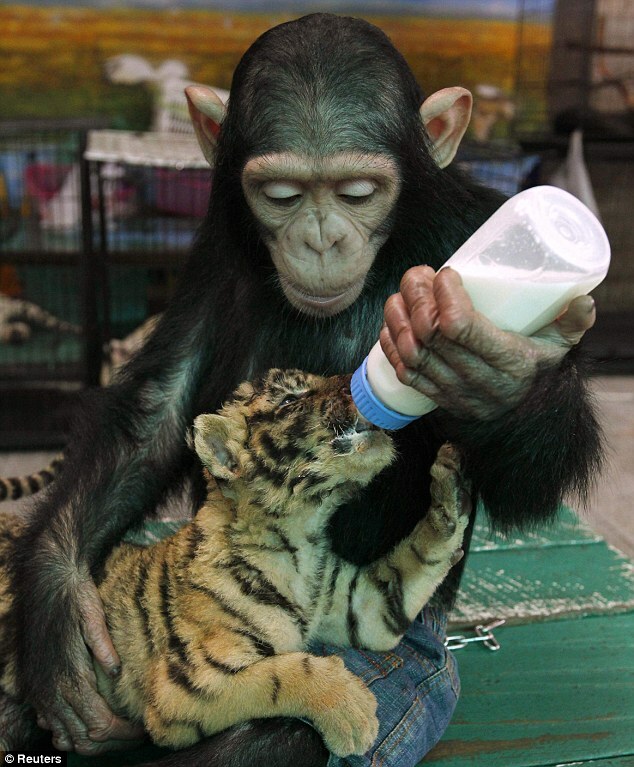 Aorn gratefully laps up the milk as Do Do tenderly holds the tiger in her arms. For some unexplained reason Do Do is wearing a pair of denim shorts - perhaps to protect her thighs from Aorn's claws. 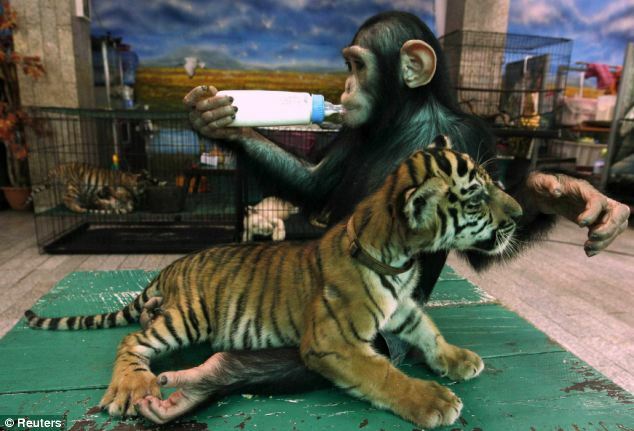 They were photographed at Samut Prakan Crocodile Farm and Zoo on the outskirts of Bangkok, Thailand. The crocodile farm, used as a tourist attraction, houses some 80,000 crocodiles and is the largest in Thailand. Its owners claim to hold the largest captive crocodile, measuring an astonishing six metres long and weighing 2,465lbs. Regular crocodile shows are staged during which zookeepers place their heads inside the reptiles' mouths. However, the farm doesn't just contain crocodiles. As you'd expect from these pictures, monkeys and tigers also live there, alongside elephants, lions, horses and hippopotamuses.